Superb quality fretboards produced in-house. 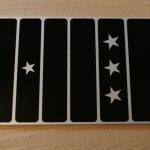 Fret markers are screen printed onto anodised aluminium. We have tried to reproduce these as faithfully as we are able to the originals. 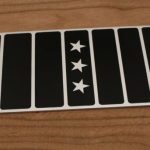 Designed as replacements for worn or battered fretboards on your vintage steel guitar, or as parts for your new lap steel project. Note: Original stringmaster fretboards are 1/8″ shorter than these – this is to allow for the fretboard to fit under the rounded nut. We have produced them to full length to allow them to be used with any kind of nut. If you want to use them on an actual Stringmaster or under a rounded nut, then you will need to file 1/8″ off the narrow end.